An interesting new study released today by venture capital and angel investment-focused research firm CB Insights found that, in a shocking twist, graduates of Stanford University do not actually dominate when it comes to building startups that nab top VC dollars. LOL, just kidding. 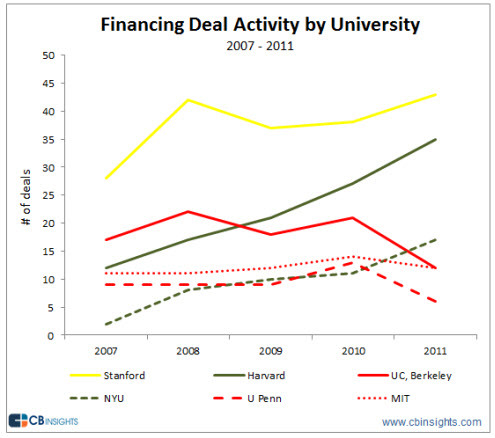 Of course Stanford alumni dominate the VC-funded tech startup space. Indeed, anyone who’s spent any amount of time in Silicon Valley notices the prevalence of Stanford graduates at every level of the tech industry, from the engineers who build web startups to the financiers who fund them. Even the blog world is not immune from the Cardinal’s reach — TechCrunch counts a number of Stanford grads as staffers, including our co-editor Eric Eldon, who was actually the editor-in-chief of the Stanford Daily back in his free-wheeling college days. The Stanford alumni network certainly feels like a real, palpable thing around these parts. And CB Insights’ study, dubbed its first-ever University Entrepreneurship Report, found that Stanford’s power is not just something that seems big anecdotally — it can actually be quantified. The report looked at the alumni from six universities that are generally considered part of the “top-tier” in terms of technology and business to evaluate how they stood in the venture capital space. The research identified $12.6 billion invested in 559 deals from 2007 to 2011, and found that Stanford was the top university in terms of its alumni receiving venture capital. Stanford alums raised $4.1 billion across 203 financings, the study found, “handily beating” the other schools in terms of deals. Harvard came in a close second in terms of all deals, thanks in large part to the role of Facebook’s co-founder Mark Zuckerberg (CB included dropouts in the study.) Once that was removed, Stanford was far and away the top school when it comes to its alumni making waves in the VC world. However, it bears mention that Stanford shouldn’t be resting on its laurels (or, I guess, its palm trees.) Stanford’s power over the Bay Area and the tech industry has been criticized at high levels recently, so the school needs to be a bit sensitive in wielding its strength. And in terms of growth, CB’s study showed that East Coast schools NYU and Harvard are exhibiting the fastest growth rates of all six schools monitored on a percentage growth basis. As in almost all research, you can quibble with some details of this study. CB only looked at six universities (Stanford, Harvard, MIT, NYU, UC Berkeley, and the University of Pennsylvania) so some people might feel like not all schools got a fair shake at showing how strong they can be in tech and VC. And of course, counting successful dropouts as alums is not always smiled upon by the people who put in the work and tuition to finish their studies. But in all it seems like a pretty realistic take. A separate recent study released by Stanford showed that in 2006, the University was the top employer in all of Silicon Valley, so it makes sense that that kind of impact is going to be felt beyond the campus’ walls. Now that the interest in tech spans so far beyond Silicon Valley, the question is how long Stanford will remain so clearly on top.